Emilie Shapiro's sunset-pink earrings encourage emotional healing and love. 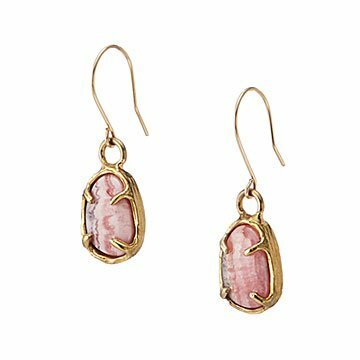 Layered with the cotton-candy colors of a summer sunset, these rhodochrosite earrings, cradled in brass, are said to have soul-soothing effects. The stone symbolizes a special kind of selfless love, one that encourages the wearer to move beyond empathy and into emotional healing. A thoughtful gift for someone you love, or an empowering add to your own jewelry collection. Pair with the matching necklace for even more impact. Handmade by Emilie Shapiro in New York. Click here to see our Compassionate Heart Necklace. Clean with warm water and mild soap. Gently scrub with a soft brush.